The school morning for four (and three) year-olds is balanced between outside play time, “home base” time, and “open center” time. 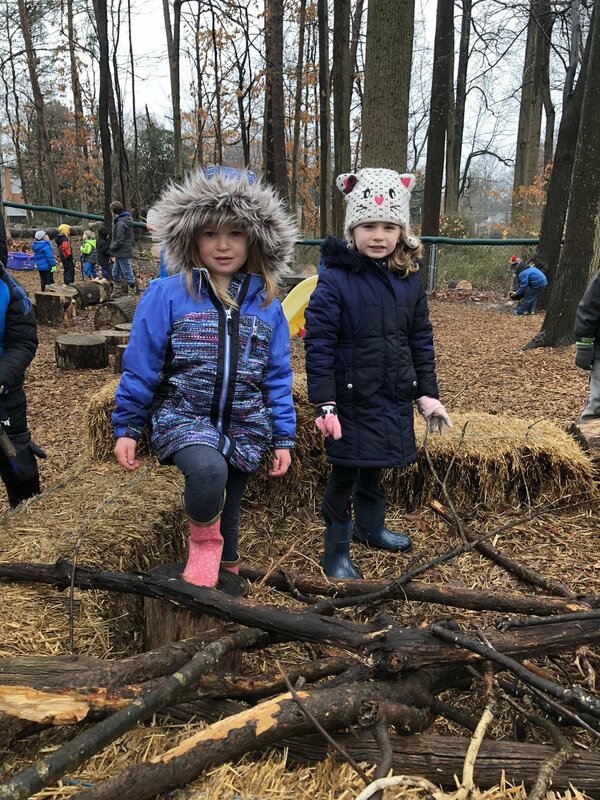 The Four Year Old Program is offered four Days a week: Tuesday, Wednesday, Thursday and Friday from 9:10 a.m. to 12:05 p.m.
All three and four year old classes join together on our natural, expansive playground daily. The facility contains a wide array of equipment including age-appropriate superstructures, sandbox, bikes, and art easels. On most days, a variety of art supplies are available on the playground for quiet creative play. On some days, other teacher-inspired games or activities, such as nature exploration, are offered. The Sleepy Hollow Preschool philosophy of learning through play flourishes in the open center program. During this portion of the day, children are free to move from one room to another and to choose among the various opportunities in each. Teachers guide and encourage the children as they construct their individual experiences. Each unique center offers a range of activities that are consistently available every day. Additional activities vary from day to day based on children’s interests as well as seasonal themes and other educational inspiration. Children join their respective classes in their rooms for teacher-led group activities such as songs, stories, and conversation in circle. The students enjoy a family style snack together. Home base allows the children to build a cohesive sense of community. Classroom traditions are built around events such as holidays, birthdays or other special Sleepy Hollow events. Home base provides time for the children to develop confidence when functioning as part of a group, which will help them succeed socially as they enter kindergarten, and throughout their academic careers. Our four year old program prepares our children to succeed as they enter kindergarten and pursue their school careers. We ensure they have the social and emotional skills necessary to participate in a school community, form friendships, and engage in the classroom as curious and inquisitive students. Students in our fours program are exposed to various preliteracy skills such as identifying letters and letter sounds, writing the letters in their own name, interacting with age-appropriate texts. Students practice beginning math concepts such as comparing and contrasting, categorizing, and counting. 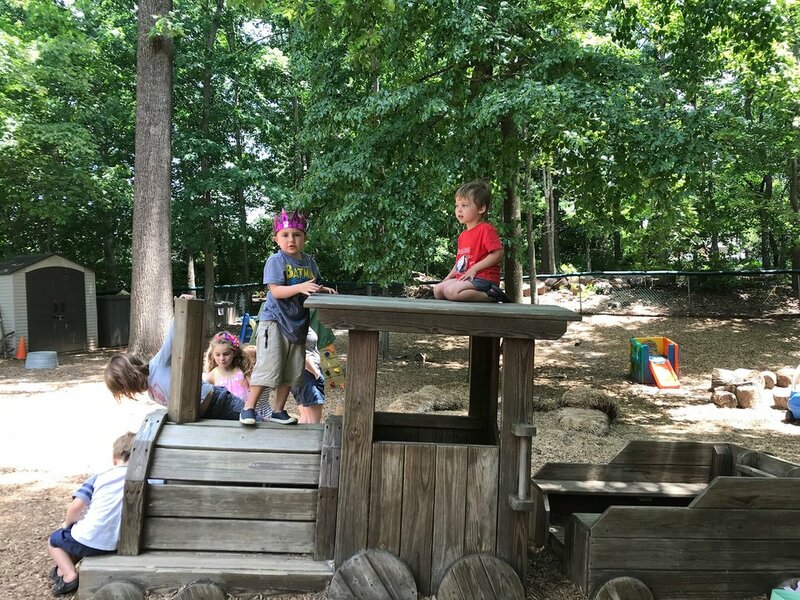 Sleepy Hollow Preschool fosters a natural sense of curiosity, and provides children with a love of learning, which they carry with them as they begin their elementary school lives! Outside Play: Children are free to choose from a variety of activities available to them. 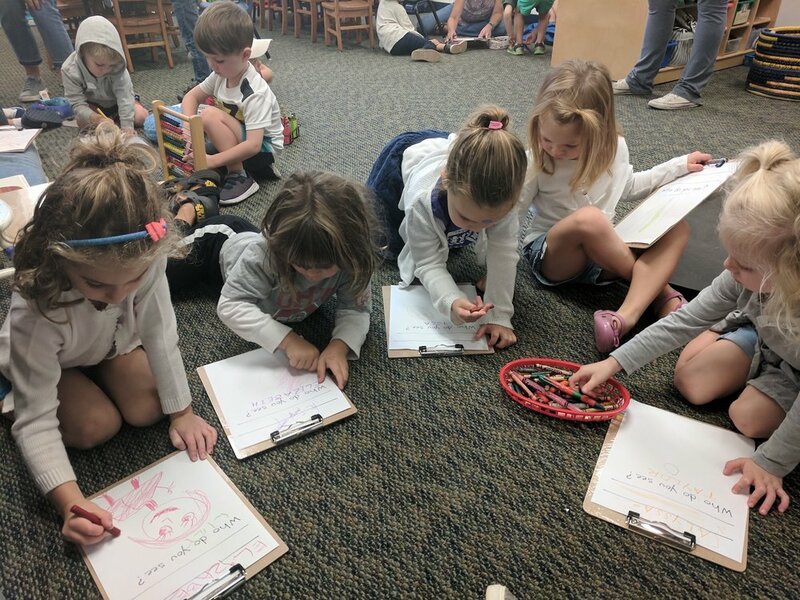 Home Base: Children join their respective classes in their rooms for teacher-led group activities such as songs, stories, and conversation in circle. Snack: Each co-oping parent provides a nutritious snack for children to enjoy while practicing manners and engaging with one another. Open Centers: With guidance from their teachers, children are free to move among the classrooms and participate in different projects. SHPS creates a rich, stimulating environment where children are respectfully encouraged and supported in pursuing, creating, and exploring their own interests. Each classroom is staffed by a teacher and a teaching assistant in addition to a co-oping adult. Sleepy Hollow follows (or improves upon) the adult/child ratio as set forth by the National Association for the Education of Young Children. This ratio for three (and four) year-old classes is 1 adult for each 8 children. The birthday cutoff for all classes is September 30, in accordance with the kindergarten entry age of the Fairfax County public school system. Children enrolling in four year-old classes must be at least 4 by September 30. Students are NOT required to be potty trained at SHPS. Your child will be accommodated, whether he/she is still in diapers, in the midst of toilet training or fully trained. At Sleepy Hollow, we believe that good communication makes for a tight-knit and trusting community. All teachers keep in close contact with parents, providing a recap of the day at pick-up time, as well as frequent emails about what the children are learning and enjoying. Parent class representatives also keep the other parents abreast of upcoming school events, meet-up opportunities outside of school and more. Sleepy Hollow provides parents with the opportunity to give their children the gift of an extra school year if they have a late birthday or do not seem ready to advance to the next class. 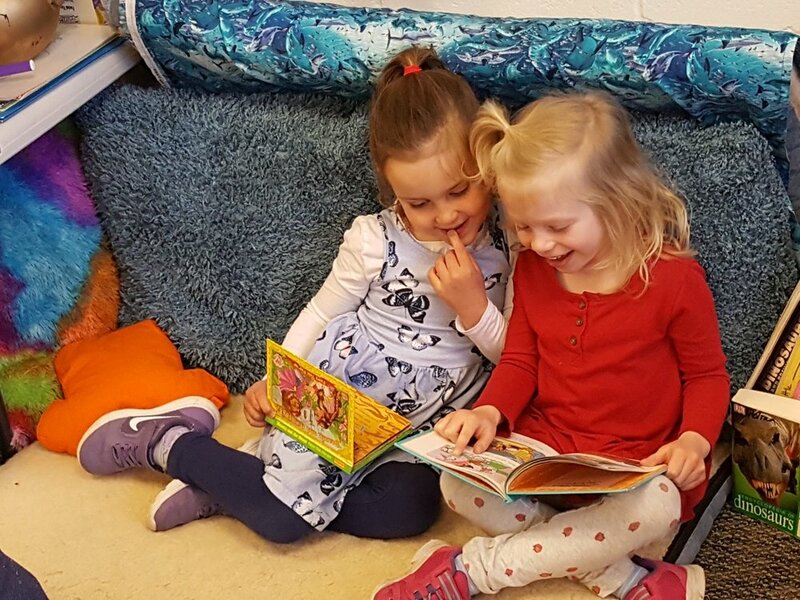 Five year-olds who are given this opportunity will continue enjoy another year of endless opportunities for learning and fun in the fours classroom. The Dolphin class is where Scribbles, the school's guinea pig lives. Scribbles loves to be to fed and pet during the school day. He enjoys weekend getaways to SHPS family homes - yes, you can have a pet for the weekend for the whole family to enjoy! The Dolphin room also has a large water table where groups of children can pour and play as they learn about measurements, buoyancy and sharing. 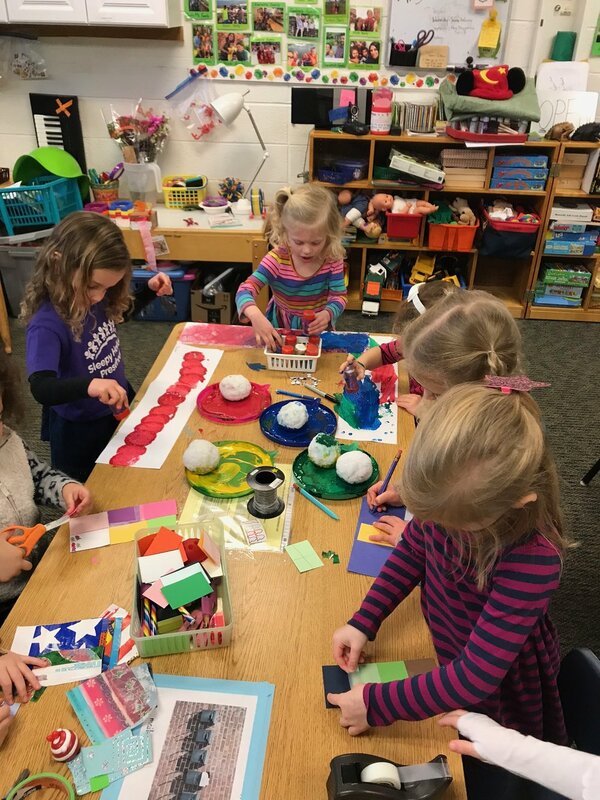 Lots of individual or collaborative planning and building happens in Dolphins whether with wooden blocks, color blocks, tinker toys, Lincoln Logs or an assortment of other put-together toys. Build it high or low for animals, action figures, cars or Polly Pocket dolls to live...or just build it to knock down! The Frog Class invites our children to discover the free art/project shelf, the light table, the ever-changing sensory bin and the loose parts. During Open Centers, the children come on their own, bring a friend or make a friend in the Frog's Room. Children realize and expand their ideas, projects or play with open-ended determination. In the Sleepy Hollow Way, children learn to join together - collaborating, testing, building, creating, sharing, experiencing. Our Froggy Room has our comfy corner, children's literature, musical instruments, science/math manipulatives as well as toys - all 'ready for action' to support our children learning through play.